Xbox 360 space marine shooter Halo: Reach gets its first map pack on Nov. 30, according to Microsoft. The Noble Map Pack will include three new maps and new Achievements worth an extra 250 Gamescore points. It will cost 800 Microsoft Points, or about $10. Tempest – "Though we may never fully understand these devices, it is not our nature to leave ancient stones unturned." This abandoned shoreline facility bends both sea and sky to an unnatural purpose, but the ground itself has quickly become another all too familiar battlefield. Though the two opposing symmetrical bases may never reveal their ancient purpose, both now offer makeshift shelter and access to strategic routes perfectly suited for small and large scale skirmishes alike. Tempest supports 8 – 16 players and offers a variety of modes including Free for All, Team Slayer, Team Objective and Big Team Battle. Tempest also provides players with a huge Forge palette, allowing them to create new custom map variants that can be shared with the community-at-large. Anchor 9 – "Orbital dockyards provide rapid refueling and repairs for a variety of UNSC vessels." Within the confines of this low orbit dry-dock, UNSC craft undergo rapid repair and rearmament in support of the enduring war effort. 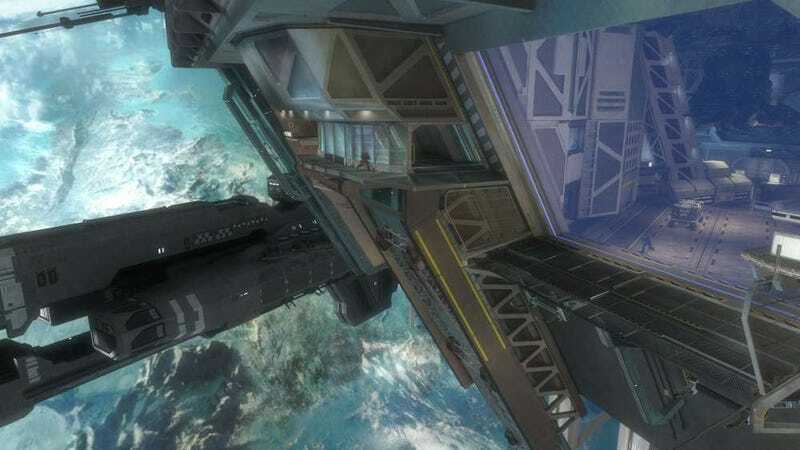 But for the small squads of infantry who now fight over the mirrored interior hallways and open central hangar bay, this platform no longer provides any safe harbor – whether the close quarters combat is occurring inside or out of its artificial gravitational field. Anchor 9 allows 2-8 players to face off in game variants including Free for All, Team Slayer and Team Objective. Breakpoint – "ONI officials believe the data buried within this artifact is key to our survival." Atop this icy precipice, the Invasion continues. These modular archaeological labs were never intended to withstand such a large scale onslaught of Covenant military power, but the information being extracted here may prove vital to humanity's survival. In response to the imminent Covenant threat, UNSC ground and air assets have been deployed to bolster entrenched Spartan countermeasures. This dig site must yield salvation, or it will become a grave. Breakpoint offers multiplayer mayhem for 8-16 players, and supports the Invasion and Big Team Battle game variants.